Dassault Systèmes reassures users that desktop Solidworks won't disappear but it still dreams of Cloudy future. Figure 1: CEO Bassi describing the two pillars of Solidworks, desktop and online. During January’s annual Solidworks World love-in, Dassault Systèmes made what could be perhaps its most important announcement in a decade: Desktop Solidworks is here to stay. This comes following the French company’s attempts to cloud-ify the software since 2007. During the annual user conference this year, Solidworks CEO Gian Bassi showed a slide in which he heralded a two-pillar strategy: One pillar made of desktop Solidworks, the other online (Figure 1). The reason possibly for that turn-around is that the second pillar, Online Solidworks, is still relatively weak. It turns out there is no such thing, except the name given to a variety of browser-based programs running on Dassault’s 3Dexperience platform. Historically, Dassault has failed at cloud-ifying Solidworks and made little headway in linking Solidworks with its 3Dexperience software. Dassault has shipped little, most of which has been rejected by Solidworks users. It’s no surprise, given that 3Dexperience offers users what they don’t want: A different file format (Enovia), a different kernel (CGM), a different user interface (3Dexperience), and a different price – a more expensive, subscription-only price. And, as we’ll see, even the product naming is confusing. “We want to build you a ramp to what is coming next,” Bassi announced and then proceeded to ignore Solidworks for the rest of his keynote. Instead, he showed Web-based Dassault applications in the order that users might employ them in their projects. “From dream to doorstep” is how he described deploying the following five apps for designing and making a bracket, from an initial sketch to delivery by FedEx. Figure 2: Solidworks Product Designer performing a motion study. The company’s 3DExperience Social Collaboration Services app facilitates the dream stage by collecting all information about a design project, such as scanned-in napkin sketches and third-party parts shared from other systems. It is meant for online collaboration between designers. “Think of it as a Google Drive that understands how Solidworks builds knowledge,” Bassi explained. The Solidworks 3DExperience PLM Services app is for tracking changes and doing other product lifecycle management tasks. Solidworks Product Designer is a suite of programs for doing mechanical design (e.g. parts, smart assembly, motion simulation, sheet metal, drawings and BOM) – all running on the 3Dexperience platform (Figure 2). “It is art-to-part and is natively integrated with everything you have seen so far and will see today,” Bassi said. A related program, Solidworks Industrial Designer, was given only a brief mention, while Solidworks Conceptual Designer was ignored. The Solidworks XDesign app is meant for design on-the-go, running in WebGL-compatible browsers specifically on tablets and laptops. It offers design, mass reduction and collaborative task assignment. It has Design Guidance, in that users specify connection points and force conditions, and then XDesign suggests a design. It was first introduced in 2016, but rollout has been delayed; the xdesign.solidworks.com web page still only hosts a feel-good video and the beta signup form. 3DExperience Marketplace Make is the final stage, the doorstep. This app is for finding contract manufacturers certified by Dassault. You specify the materials for manufacturing your 3D model, get a fixed-cost price and a delivery date. “We want to become the Amazon for engineers for all over the world,” Bassi proclaimed. While he didn’t state it explicitly, Bassi’s message was clear. All the design work he demo’ed using only online apps strongly suggests Dassault still aims to convert desktop Solidworks users for the recurring income and to eliminate the expense of developing in parallel an incompatible MCAD program. Solidworks 2018 launched last October but, just three months later, Dassault is already showing what it might add to Solidworks 2019. At SSW 2018, Solidworks employees demo’ed an impressive list of functions that might (or might not) make it into the next release. Figure 3: Hand sketching markups on a touch screen. Perhaps the most interesting new feature is the ability to convert hand-made sketches to features automatically. Solidworks already recognizes hand-drawn lines, circles and arcs, but 2019 could add editable splines and slot sketches. Related to this, markups (notes and simple 2D sketches) can be drawn with touch screens on top of 3D models, and then saved with the drawing (Figure 3). Chamfers and fillets can be partial and their length can be adjusted by distance, a percentage, a reference or by dragging handles to specify the starting and ending points. Three-D parametric textures can be applied to solid models as a single part. The new Texturize Bodies command converts images to features. The Surface Dial (from Microsoft) will be supported for actions like panning, zooming, rotating and accessing common commands. It looked to me like a 2D version of the 3dconnexion mouse. Defeaturing is useful for making expansive models smaller (thereby increasing performance), for reducing overwhelming details in 2D drawings and for hiding intellectual property from contractors. When an assembly is defeatured, Solidworks creates a “silhouette” of the model that lacks minor features, like fillets and unnecessary holes. 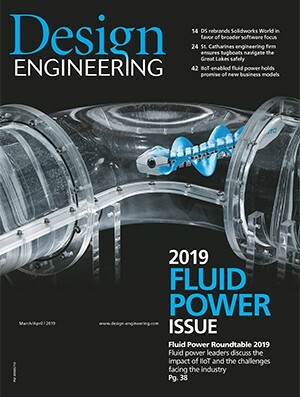 In 2019, users may have the option to defeature an entire model, individual parts or specific bodies – such as turning a motor into a cylinder, but leaving the gearbox fully detailed. Related to defeaturing is saving models as multi-body parts, which are more compact; in 2019, this is improved by being able to specify which details to keep. Even better, the full mass properties can be retained for these streamlined bodies. All external references can be removed with a single click. Also in the interest in reducing detail, de-noising technology by Nvidia speeds up renderings by up to 10x by eliminating visual aspects that are unnecessary to rendered scenes. Figure 4: Slicing planes applied to a part designed with topology optimization. A hyped-up feature in MCAD these days is the topology study, which optimizes mesh shapes based on stress levels, factors of safety and connection points. The result is an organic-looking shape that sheds all material not needed for strength or connections (Figure 4). Other CAD packages call this “generative design.” The resulting organic shapes are usually rather ugly, so a new slicing tool in SW 2019 will apply one or more planes, from which sketches are derived. You use the 2D sketches to define a new smoothly-shaped 3D part that mimics the organic shape, or else references it to other features. When it comes to organizing 3D models, SW 2019 will group mates by status, so that the same ones are shown together in the history tree. This is useful for grouping mates with errors, as well as ones that are over-constrained, solved, suppressed or inactive. Finally, 3D models will be exported in a virtual reality format for viewing with the eDrawing viewer and VR goggles. For the future, Bassi emphasized that Solidworks will benefit from more integration and automation – where more and more functions, especially simulation, are integrated into the core Solidworks and 3Dexperience programs. Artificial intelligence will take over some tasks, such as Design Guidance. Dassault is also working on IoT (Internet of Things) by simulating the electrical-mechanical design process through a cloud-based add-on for Solidworks, created by third party developer, Seebo (Figure 5). “IoT is making product design way more complicated,” admitted Seebo co-founder, Lio Akavia. Even though “75% of IoT projects fail,” he said, IoT is seen as useful for predictive maintenance and remote monitoring. To improve the odds, Seebo reads the Solidworks file and then does much of the IoT design work semi-automatically. Figure 5: This cloud-based add-on by Seebo reads Solidworks CAD data and helps designers integrate IoT functionality in their mechatronic designs. As another example of the future, tech startup, Meta Co., gave a live demo of its augmented reality hardware. On the Solidworks World stage, a four-sensor visor displayed the design environment. Available Solidworks models were placed on virtual shelves to the right, a history tree was at the upper left (in the blue frame), and model states and animated models are gathered around the bottom of the stage on which the model sat. The model can be scaled (such as between small and 1:1) and exploded into parts. And so it was that the 5,500 users who trekked to Solidworks World were relieved to see Solidworks staff showing off a string of remarkable functions for the 2019 release – some brand-new, others copied from competitor MCAD programs. This is, after all, the software upon which they depend for their livelihood. Dassault, however, wishes that the millions of Solidworks users would finally see the light and switch. The problem for Dassault is that none of the apps demo’ed is available or even has a price attached. As all traditional CAD vendors have learned to their chagrin, getting 3D design software to run efficiently in the cloud is really difficult. In the meantime, desktop CAD thrives. Solidworks 2019 goes into beta in the second half of this year, and will ship in the fall. Solidworks World 2019 will be held February 10-13, 2019 in Dallas, Texas. Ralph Grabowski writes on the business of CAD on his WorldCAD Access blog (www.worldcadaccess.com) and weekly upFront.eZine newsletter. He has authored many articles and books on AutoCAD, BricsCAD, Visio and other design software.